In seems as though Kenya is sticking to if she creates her own truth and believes it enough others will follow. Personally, I don’t believe she’s concerned with her castmates believe or even if the Captain of Cute Shade, Andy Cohen, believes her. Rather, she’s out for the coins. If she plays the part of crazy well enough she can become the new Omarosa, remember her? Find her financial footing by getting in good with the gays and reel in money for appearances, hosting and possibly a spin-off. Her crazy is ad nauseum, but enough people are buying into that she’s been rehired for another season. I see your business plan girl, twirl to that. Porsha had her marital rights speech down pat. It was so poignantly rehearsed, so dramatically unnecessary and the language was simple enough to fit into her vocabulary that whomever helped her prepare that should be give two claps and a side glance of shade. In hindsight, is Porsha embarrassed watching that playback after she found out about her divorce via Twitter? Porsha is a beautiful young woman, I think she just needs to take a wee bit more time to think before she speaks and she can stick with the dutiful wife bit (no shade to be thrown there), she’ll have no problems finding her a new husband to be the head of her household. Just don’t make the same mistake twice and marry another queen. The best part of the show overall, was seeing the husbands/fiances come out and genuinely stand behind their significant others. It’s easy to throw stones at a glass house especially when it’s on a national TV show, bu for all their past transgressions, Peter, Apollo, Todd and Greg all came through and did great supporting their women, defending Walter and giving Kordell & Kenya the business. Marriage ain’t easy so it’s nice to see that folks have worked together and upwards and we can get some slivers of positivity in between the gone with the wind twirls and overly emphatic speeches. And of course what would a Real Housewives reunion be without the great hosting of Bravo Andy. He’s optimal skill of throwing shade with a smile, pulling cards and being the one person on stage that no one (sans Terese Guidice) will ever come for, because he is the VP of Development & Talent (basically how one lands on a show to begin with). He pulls the strings and throws the shade. We can all aspire to be so delightful. 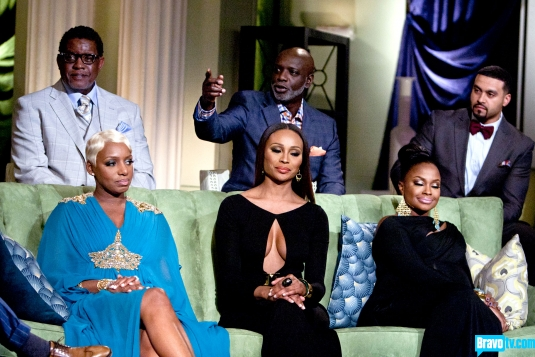 What were your thoughts on the reunion show? Love the looks? Hated it? Are you buying Kenya’s act or Nene’s new maturity? Leave a comment down below. P.S. You can now add images to your comments there is an upload link below the submit button. P.S.S. All animated gifs are from RealityTVGIFs, hilarious gifs and a good laugh on your lunch break.